Further details of individual tools are available within the Additional Resources. The TSCA offers significant enhancements over traditional software-based deferred-time (stored streams) MPEG analyzers. The combination of an innovative high-speed analysis engine and built-in intelligence, allows ultrafast pinpointing and debugging of intermittent faults in MPEG Transport Streams used in next-generation DTV and IPTV systems and services. The TSCA also provides real-time analysis of Transport Streams received through the MTS430’s stream interfaces, including IP and RF. The real-time analysis includes cross-layer time-correlated IP and TS measurements, alarms, and error logging together with stream recording. Standards compliance is ensured through built-in customizable scripting supporting the broadest ranges of ratified and evolving DTV standards, including ATSC, DVB-C, DVB-H, DVB-S, DVB-T, ISDB-S, ISDB-T, ISDB-TB, and MPEG. To maintain compatibility with the latest standards, flexibility is the key. 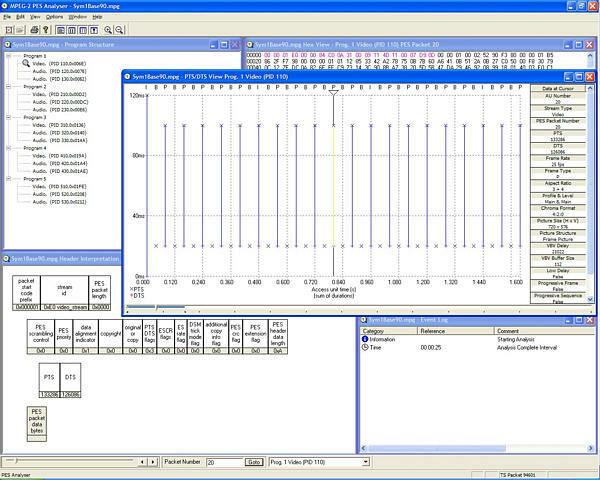 New standards and proprietary tables can easily be catered for by loading Tektronix-supplied updates, or creating your own custom scripts. Duplex operation of the real-time TSCA and Player allows end-to-end system test (maximum aggregate bit rate is 214 Mb/s for simultaneous input and output operation)*2. 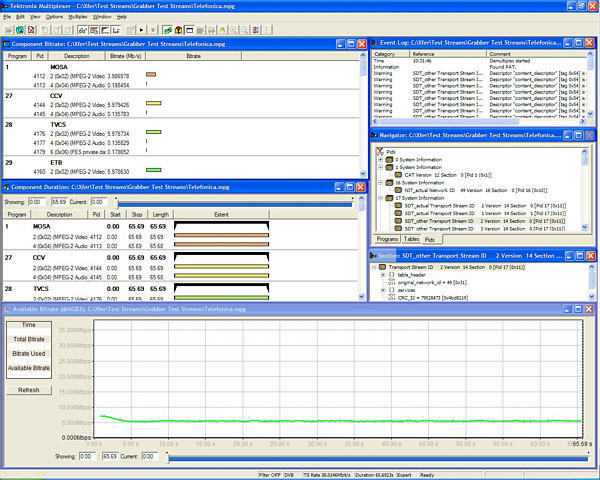 The Player tool provides a Transport Stream stimulus for a device under test through the ASI, SMPTE310, LVDS (DVB Parallel) or IP stream interfaces. Continuous playout of looped streams is possible at up to maximum ASI rate of 214 Mb/s with automatic updating of time stamps. 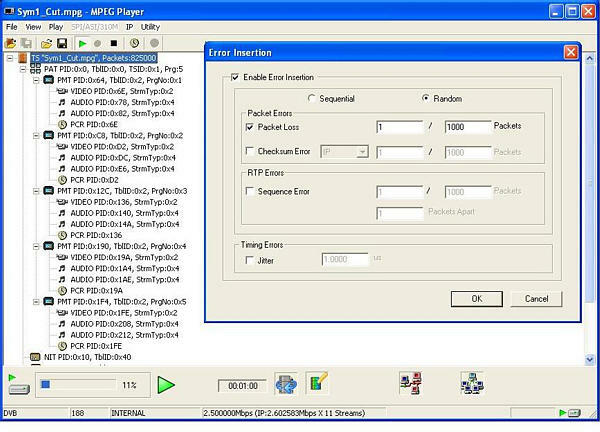 Playout rate can be automatically determined from file PCRs or manually set. Simultaneous playout and recording (duplex operation) for end-to-end system test is supported with the ASI/SMPTE310M and LVDS interfaces. Use the Multiplexer/Remultiplexer/Demultiplexer application to create and modify multiprogram Transport Streams with custom SI/PSI/PSIP information for DVB, ATSC, ISDB*3, and MPEG compliant Transport Streams. Video and audio Elementary Streams, may also be multiplexed into a Transport Stream. H.264 streams, both with and without SEI timing messages, are supported. Bit rate and frame rate auto-detection features aid the import process. *3 This includes ISDB-TB (Brazil) and Single Segment mode. 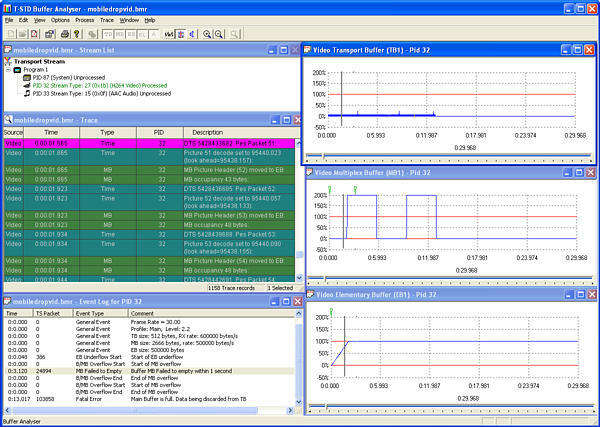 Two direct stream manipulation packages are supplied as standard with the MTS415. TS Cutter allows resizing of Transport Streams. TS Editor allows direct editing of Transport Streams using a hexadecimal view as well as a header interpretation guide. Whether developing a new CODEC chip, integrating a CODEC into professional or consumer equipment, or integrating different vendor’s equipment when rolling out new services, the ability to verify the compliance of an Elementary Stream is crucial. This tool checks for compliance of an Elementary Stream to either next-generation VC-1, AVC/H.264, and MPEG-4 standards, or legacy MPEG-2 and H.263. Audio decode and waveform display of MPEG-2 audio (ISO/IEC 13818 parts 3 and 7), AC-3, and MPEG-4 AAC are also supported. Frame-by-frame and block-by-block displays allow for ease of CODEC comparison. Synchronized displays allow the user to quickly ascertain the effects of each reported error. 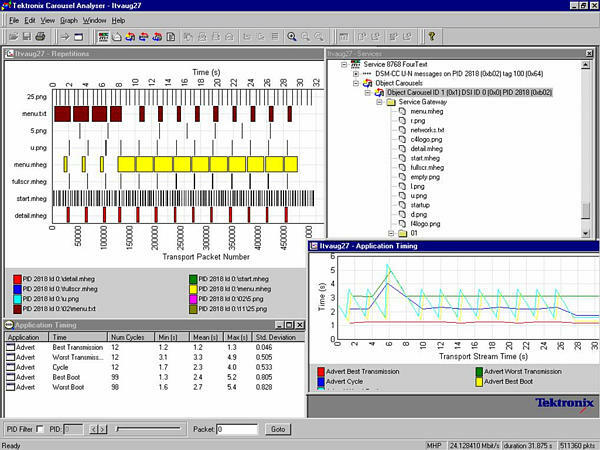 A Batch mode allows the tool to be integrated into an automated test system. For analysis of MPEG-4, AVC/H.264, and VC-1, as well as MPEG-2 Elementary Streams, please refer to the MTS4EA. Packet Interarrival Time (PIT) for all sessions. *4 For compliance with IEC61000-4-3 (Immunity) the Input Signal Amplitude must be ≥ –40 dBm. *5 Please note that the Turbo 8PSK option does not support nonturbo 8PSK (DVB-DSNG), or DVB-S2. For information, please contact Tektronix. *6 Level 1 and Level 2 interleaving support compliant with all ITU J-83 Annex B, excluding I, J = 128, 7 and 128, 8 for 64QAM and in 256QAM excluding I,J = 8, 16 and 16, 8.